A cup of quality coffee is essential for special times, and Sunbeam offers you the ideal way to prepare your next cup with their EM5000 Café Barista machine. This manual coffee and automated milk machine gives you the same quality coffee you’ll find in a café, without even putting your feet out your home door. One of the joys of café coffee is the frothed milk, and it requires some skill to get it exactly right. With the Sunbeam EM5000’s automatic milk froth feature you can leave this tricky task to the machine while you relax. Simply pour milk into the reservoir and push a button. You’ll be supplied with the perfect froth for your drink. 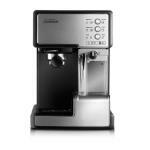 You can pick from a variety of drinks, because the EM5000 can produce an espresso, a cappuccino or a latte. Whatever your desire on any given day, simply place your order on the one-touch control panel, sit back and enjoy. If you didn’t use all the milk, you can take out the reservoir and store it in the fridge for your next cup. These great features are incorporated into a relatively small machine that weighs only 5.4kg, which makes it easy to handle and clean. The coffee machine has a silver finish that will enhance the aesthetics of any room, making the Sunbeam EM5000 the ideal addition to your kitchen.